The Farm Safety Partnership today launched its new Action Plan 2017-2020, entitled ‘Sustainable Safety’, highlighting its ongoing practical approach to every day farm safety. Improving farm safety is of critical importance to the farming community today in Northern Ireland, and the FSP has worked tirelessly over the last five years to change the mind-set and behaviour of farmers and their families. While much progress has been made, there remains much work to be done. 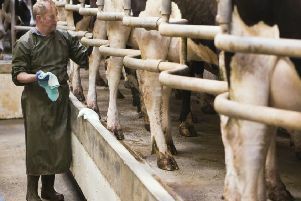 A 2015 survey of Northern Ireland farmers suggests that there could be as many as 100 incidents per month on farms which require some form of medical intervention, many of these needing hospital treatment. At this level, it is sadly unsurprising that some of the more serious incidents can result in life changing injury or death. Speaking at the launch Keith Morrison, Chairman of the Farm Safety Partnership said: “Farming and food production play a crucial role in the life and economy of Northern Ireland. But unfortunately we have also seen farming in the headlines for the wrong reasons. All too often accidents happen on our farms which are preventable, so we want to continue to raise awareness for everyone working on, or visiting, a farm. The key aim of this new three-year plan is to ‘To change behaviours by ensuring that farmers, their families and their employees are capable, motivated, and able to work safely and thereby reducing accidents on farms’. To this end, it is the firm belief of the FSP that by working together a sustainable reduction in injury rates and occupational ill health in the Northern Ireland farming industry is achievable. Also speaking at the launch, Barclay Bell, President Ulster Farmers Union, said: “We all know there are many pressures on farmers, not least prices and the weather, but the greatest threat to any farming business is an accident that leaves a family member unable to work or worse.